Office Brands ‘member of the year’ presentation to Office National Kalgoorlie, from left: Gavin Ward (Office Brands CEO), Julian Canny (ONK), Warren Moffatt (ONK principal), Jennifer Nicholls (ONK), Cathie Edwards (ONK) and Grant Rattray (Office Brands business development and change manager). Western Australian dealer Office National Kalgoorlie has been named Office Brands ‘Member of the Year’ for 2017. 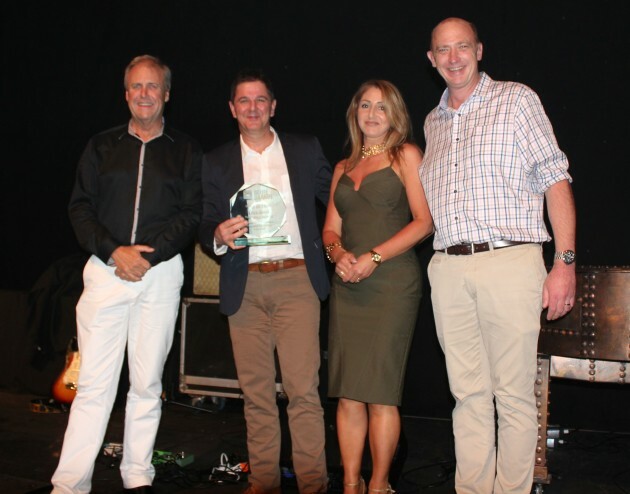 In accepting the award at the dealer group’s annual conference in Cairns last weekend, ONK director Warren Moffatt said the business’ success was underlined by the fact that it had “put two competitors out of business”. NSW/ACT: Coffs Coast Office National. O-Net member of the year: Ezi Office Supplies. Technology micro innovation award: Darren Jerrard (Albany OPD). Customer service excellence award: Keeley Mosley (Page 5 Office National. Hall of fame award for 2017: Vince Davoli (Total Office National). Total Office National’s Vince Davoli and wife Amanda accept the Office Brands ‘Hall of Fame’ award from Gavin Ward (left) and Grant Rattray.